We tell them, not all wood burning fireplaces are created equal. Back in the 1970s during the energy crisis, Acucraft founder, Roger Hansen, engineered a highly efficient wood burning fireplace that operated using two separate air flow systems. His system didn’t rob the warm air from inside the home, rather, it drew the cold air from outside, heated it and vented the warm air into the home. Since that time Acucraft has been perfecting wood burning fireplaces and is known world-wide for manufacturing state-of-the-art fireplaces with brilliant engineering for efficient wood burning, superior craftsmanship, and beautiful design. Advanced Technology – Acucraft fireplace systems combine the beauty of a traditional fireplace with the latest in advanced heating concepts. Firebox Lifetime Warranty – Acucraft builds every firebox one at a time by expert fabricators, welders, and finishers using seven gauge steel (3/16″ and 1/4″ thick). All major seams are double-welded. All moving parts are extra heavy-duty and pre-engineered for safe, trouble-free operation. Acucraft is so confident is its high quality materials and construction that every firebox is backed by a Lifetime Warranty. High-Quality Glass and 10-gauge Steel Doors – Acucraft fireplace door construction consists of high-temperature ceramic glass set in a rugged 10-gauge steel door frames that weigh 22-pounds. The trademark door design has a dual-pin locking system (top and bottom) with center-seal flange and full-perimeter gaskets for a long-term tight seal. Versatile Open Hearth Ability – Acucraft designs, engineers and builds the only wood fireplaces that allow you the option of an open hearth. You can operate your Acucraft wood fireplace with the doors open or you can remove the doors by simply lifting the them from the hangers. Other wood fireplaces will back-smoke with the doors open. Only Acucraft wood fireplaces are engineered with proper draw for open hearth operation. A specially designed one-piece firescreen can be easily inserted for added safety. Outside Combustion Air System – To allow for greater burn efficiency and performance, Acucraft fireplaces are engineered to draw the combustion air from outside your home. This eliminates drafts and utilizes your heat more effectively than fireplaces that use warm indoor air for combustion. Also, if you live in a newly built home that doesn’t breathe as well as an older home, outside combustion air is necessary to maintain proper air balance. Unique Combustion Air Manifold System – The Acucraft combustion air manifold system is designed to equally distribute air against the glass to keep it cooler and cleaner, as well as evenly distribute air to the firebox for burn efficiency. Unique Built-in Sliding Draft & Damper Controls – Acucraft wood fireplaces are designed with easy-to-use sliding draft and damper controls to give you full control over the rate of burn through the changing seasons. Firebrick Lining – The firebrick lining protects your Acucraft firebox where the temperatures are most extreme and helps maintain a more complete combustion for great efficiency. Unique Accessories – Acucraft offers a number of decorative and cooking accessories to customize the look and capability of your fireplace. Plus, when you have an Acucraft wood fireplace, power outages are no longer a heating concern. These fireplaces offer a perfect secondary heat source for whole home heating and can help greatly reduce your utility costs. So, when you compare all of these Acucraft features with other wood burning fireplace, it’s true, not all wood burning fireplaces are created equal. The Hearthroom wood fireplaces deliver a classic, rustic look that fit perfectly in a log cabin, traditional home, or even alongside modern finishes. The revolutionary engineering and design of the Unity wood fireplaces offer a clean faced look with no grills above or below the fireplace doors, yet they pack the same heat as the Hearthroom. The High-Technology wood fireplaces are for those who desire the ultimate in wood heating: the Z-MAX, Chalet, Chalet See-Through, and the Great Room. There are even custom wood fireplaces for those who desire something specific for their personality, style and space. If you are looking for an efficient wood burning fireplace, make sure you compare features, because not all wood fireplaces are created equal. Request an Acucraft Wood Burning Fireplace Catalog today! 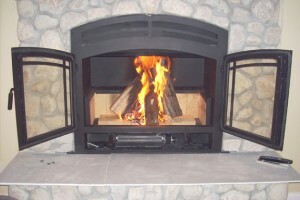 Or talk with an Acucraft Fireplace Advisor toll free 888-317-6499 or info@acucraft.com.